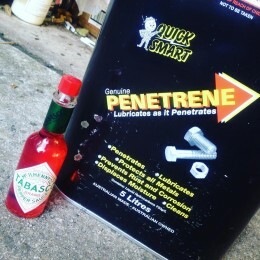 I’ve been looking for the right dispenser for my bulk penetrene for ages, and I finally found one: an old 60 mL Tabasco bottle. The dripper works perfectly with it! I bought this penetrene a couple of years ago and it’s been a royal pain to decant for use – but not anymore. Just gotta be a bit careful at BBQs around here now.